Being a fashion film photography rising star and living in Long Beach, CA is no mean feat. Larsen Sotelo is managing to do just that. 13K+ Facebook followers and counting. All within 4 years. While he has had some film photography training in college, he concentrated on graphics design. He worked in that industry, and didn’t consider himself much of a photographer. Then an epiphany! He got laid off from his graphics design job. While at the time he was despondent, he’s now thankful to his ex employers. He picked up a film camera again, and attacked photography with a passion. And with minimal technical training, his images quickly became a force to contend with. He says he did make mistakes, but learned fast. Being a millennial helps with the whole social thing, but it has been sheer talent and fortitude that has got him so far, so fast. He feels Juergen Teller, Ryan McGinley and Nobuyoshi Araki are his biggest influences,…little more art than fashion. But great choices nonetheless. Lately, he mostly uses a Contax G2 with a 45mm f2 lens and and a Yashica T4. Although when the job requires it, he has no problem using his Nikon D700. A really common situation nowadays. Most hybrid shooters are in the same boat. The real world. But he remains dedicated to Portrait and Fashion film photography. 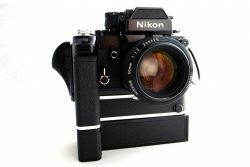 Next PostNikon EM – Nikon Fail?